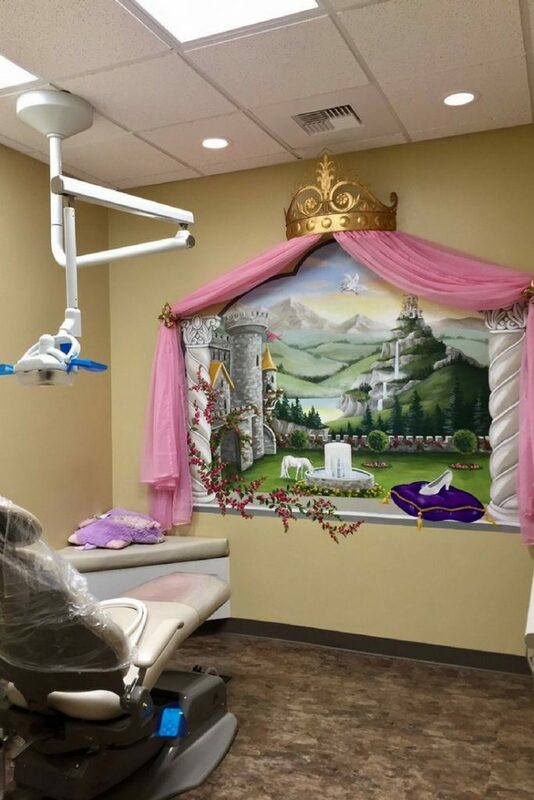 Everyone is familiar with the idiom, “a picture is worth a thousand words.” Well, you can think of your dental practice’s office design in much the same way. 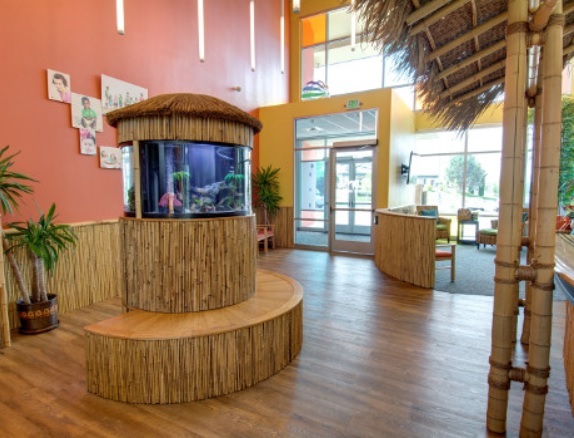 If your patients walk into your waiting room and are greeted by a larger-than-life coral reef complete with a sunken pirate ship, it will convey that your team is sincerely dedicated to providing a welcoming and imaginative experience for children. 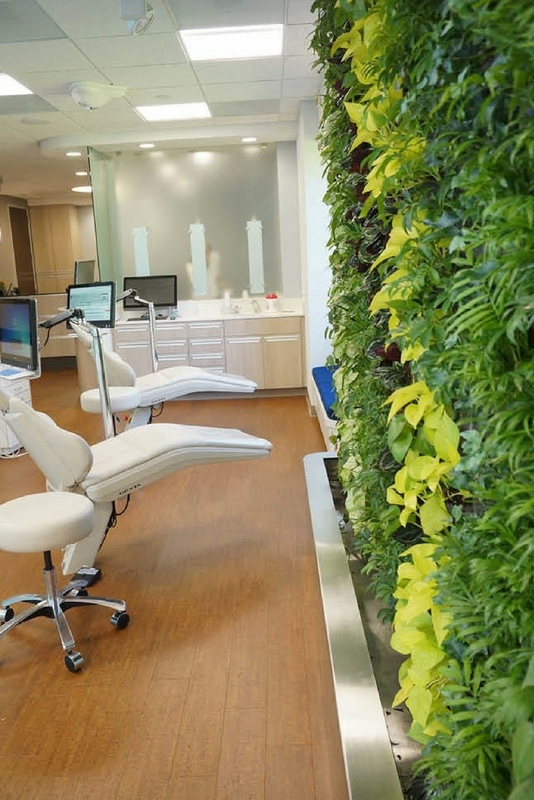 If your patients search your website and find images of an open concept facility featuring a living plant wall, it will convey that your team values staying up-to-date with the latest trends, and that you approach dental care with that same philosophy. 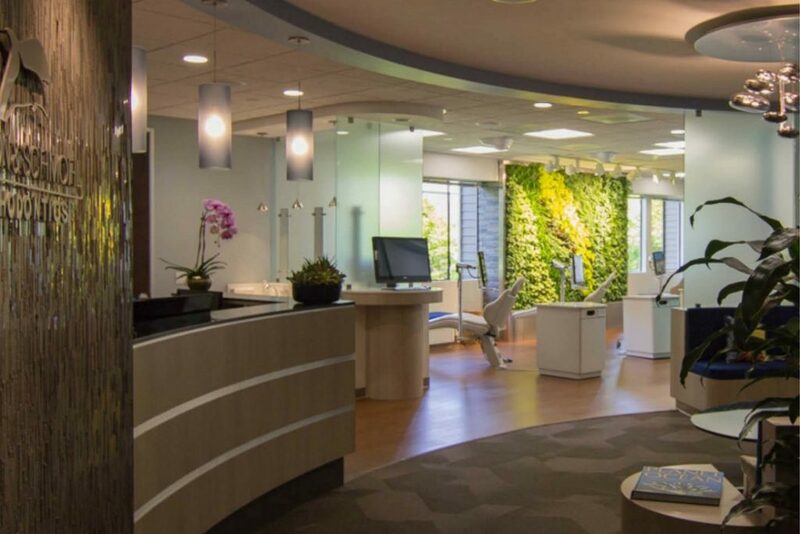 Below are a dozen dental offices that truly committed to providing a standout interior design experience. 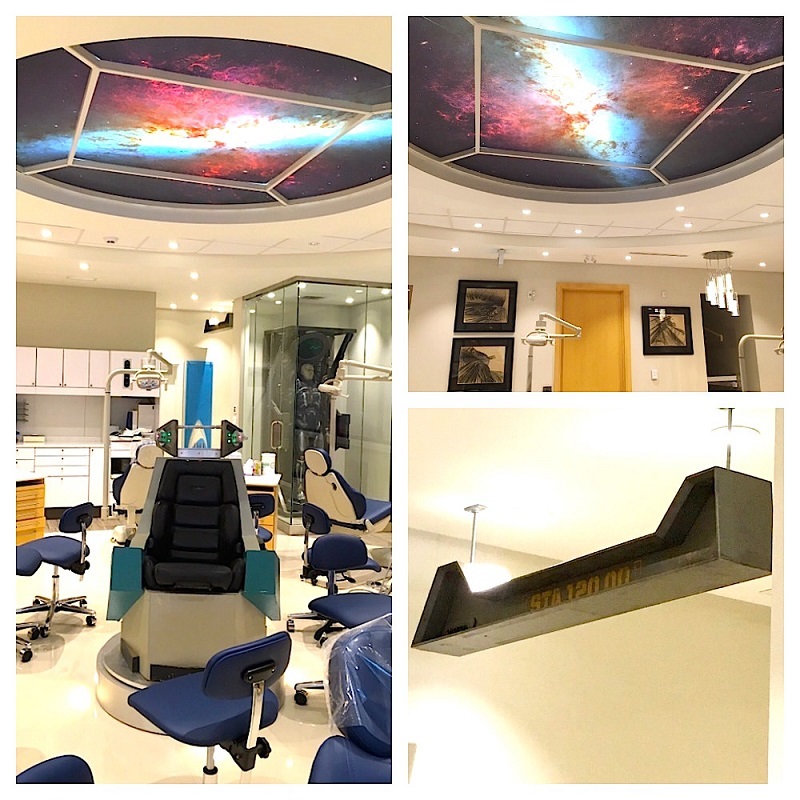 From basketball court floors, to official Star Trek movie props, these are 12 of the coolest dental offices in the country! What makes it so cool? 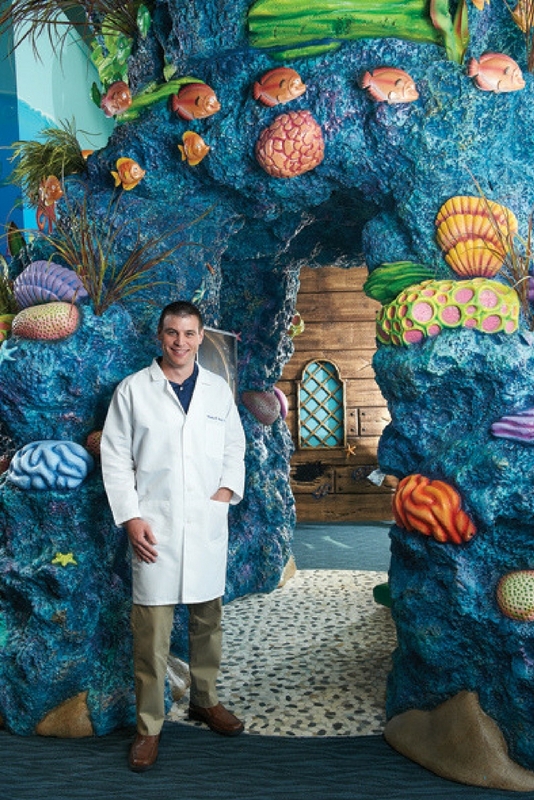 Dr. Dustin James says that if he wasn’t a pediatric dentist, he’d be working for Disney. 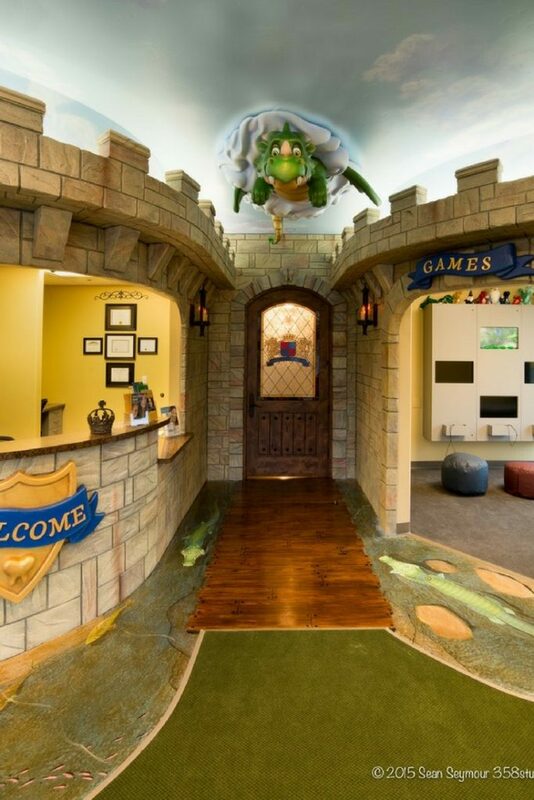 That’s instantly clear when looking inside Dentistry for Kids. 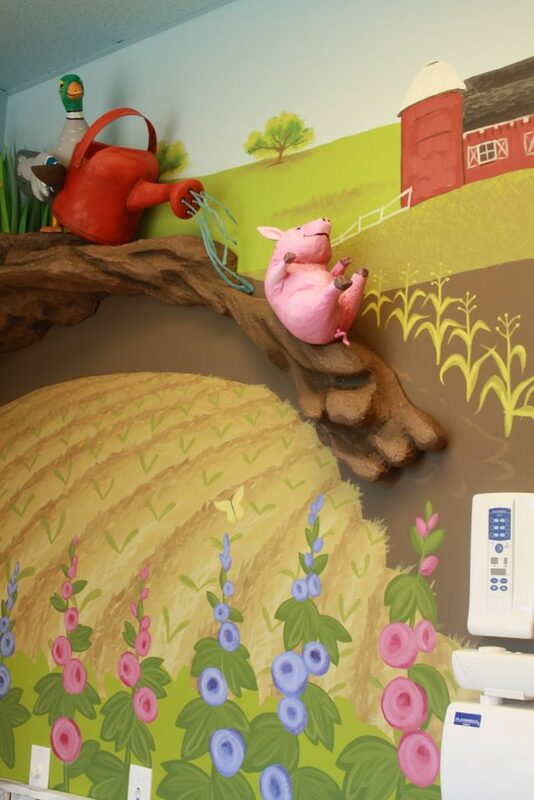 Each of the facility’s themed operatories feature hand-sculpted props by designer Aaron Christensen of Embellishments Kids. 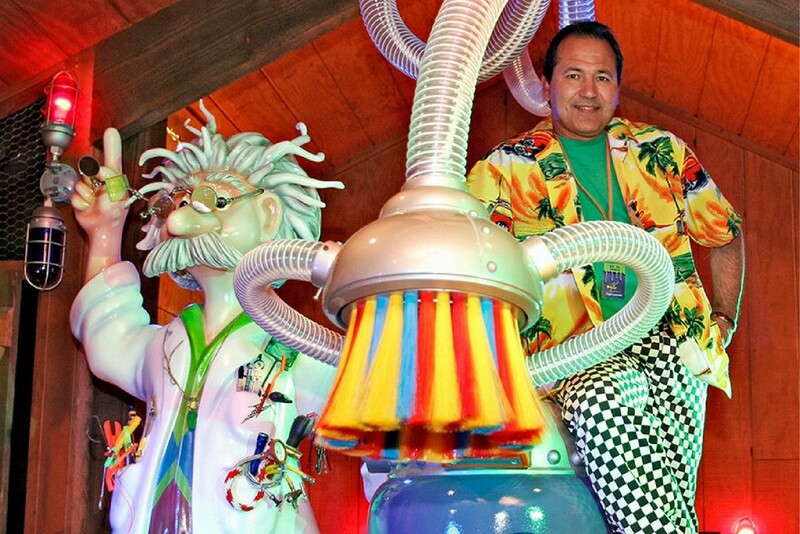 Christensen knew that Dr. James was a big Disney theme park fan, so he “designed every piece to have that retro 1955 feel, as if Walt himself oversaw the installation.” A toy train continuously circles the waiting room and visits different vignettes that represent each operatory theme. 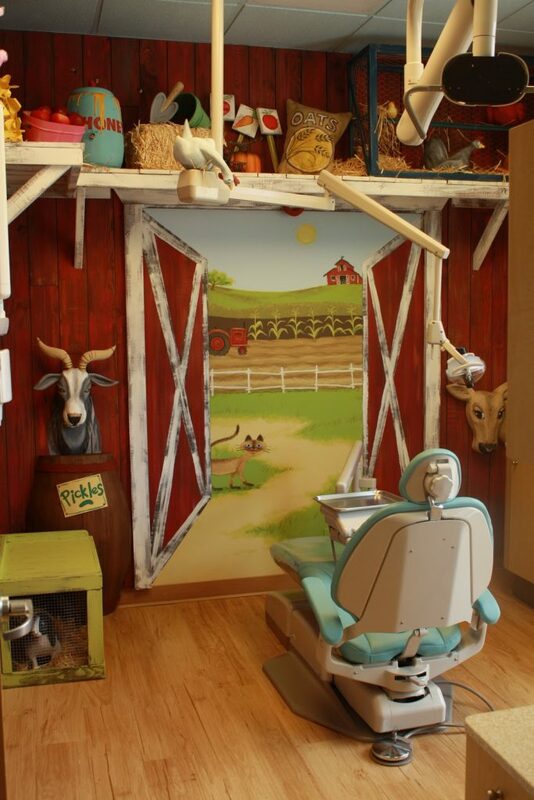 The office has even achieved a degree of “internet fame” – a popular image of the barnyard themed treatment room has 1.6 MILLION likes on Facebook! 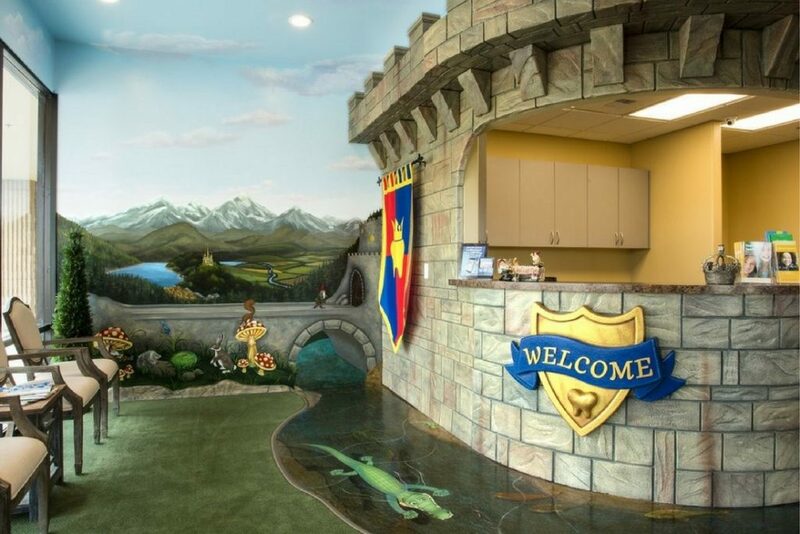 The cheery, high resolution images displayed on the Dentistry For Kids website were captured by local Oregon photographer Craig Mitchell Dyer. How you can channel the cool: If you have a clear vision for the aesthetic you want to convey, surround yourself with experts that can help you bring that vision to life. 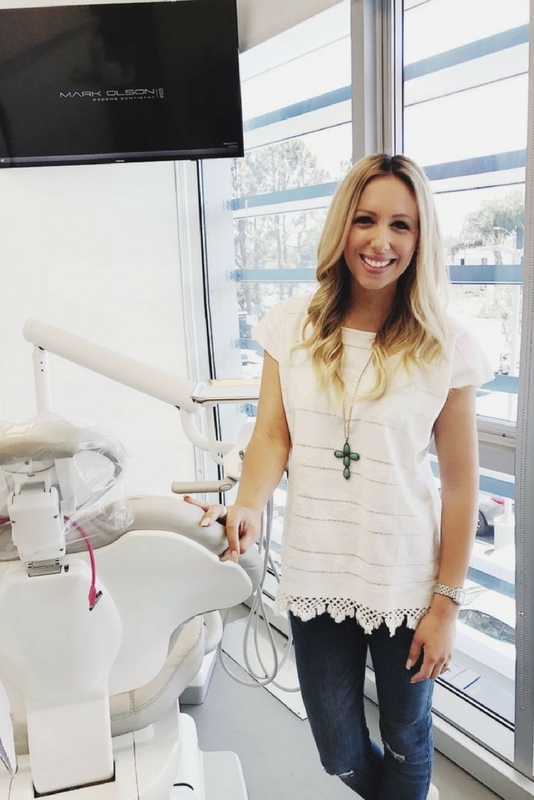 Many dentists will only build a new practice or undertake a large-scale remodel project once throughout their career, so it’s important to do it right! How you can channel the cool: If you believe strongly in something, in this case “going green,” infuse that belief into multiple aspects of your business, from building materials to marketing materials. You may find that it attracts an equally passionate clientele. What makes it so cool? 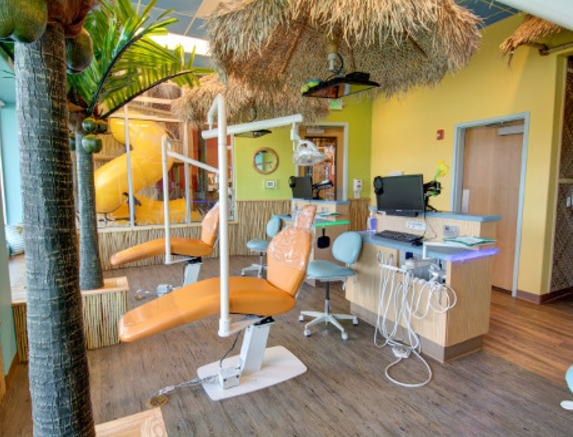 Tiny Teeth Pediatric Dentistry is a space that was dreamed up by Dr. Matthew Healy, who “wanted to have a wow factor when you walk in the door – even as you drive by. It’s a built-in advertisement of the services we have to offer, and if you have something that no one else has, people want to come there.” In fact, he says that many patients drive by the building, see it, and say that their son or daughter wants to come here because of seeing this. What is “this,” exactly? A floor-to-ceiling ocean theme that gives the illusion of being underwater. 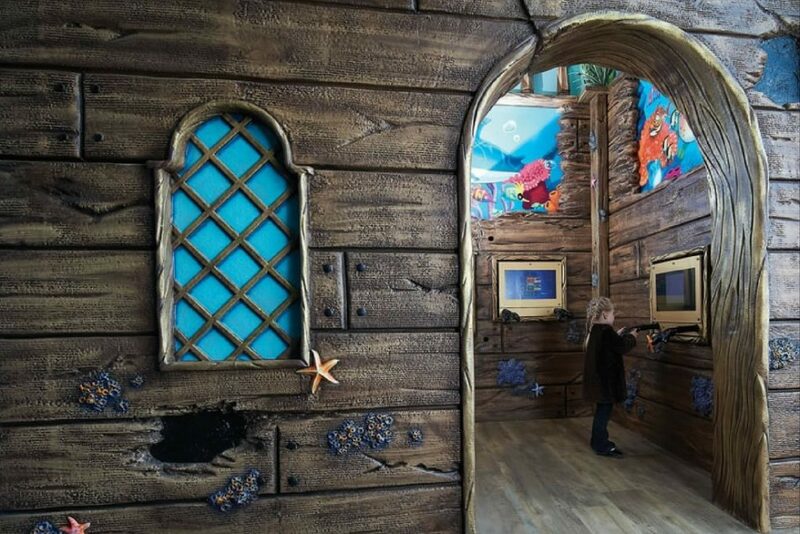 The walls of the practice are covered in murals, with waves, sea life sculptures, and a sunken pirate ship game room. You can learn more about Dr. Healy’s practice in this 2014 feature in Patterson Today! How you can channel the cool: Don’t be afraid to completely commit to a theme. In this example, patients often come in for their appointment one day and return the next day just to take photos. When your design is utterly unique it can serve as a built-in advertising tool. What makes it so cool? 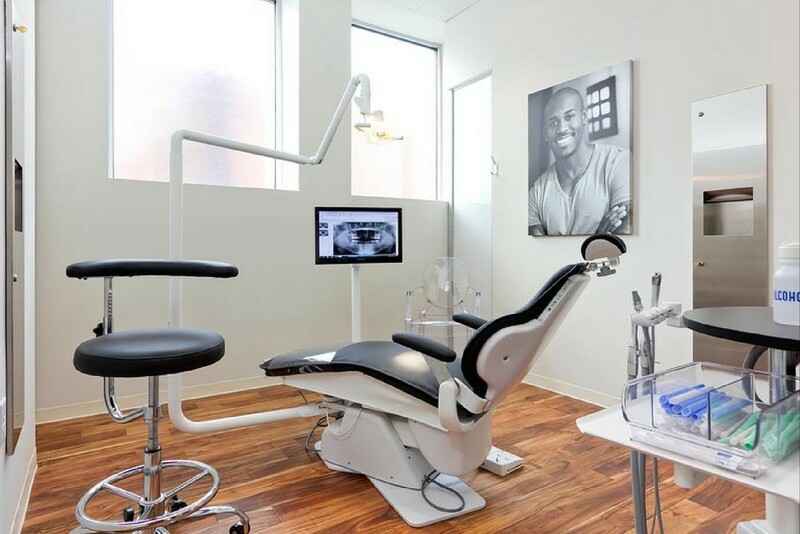 When you insert “spa” into your name, you had better deliver…and The Atlanta Dental Spa does. 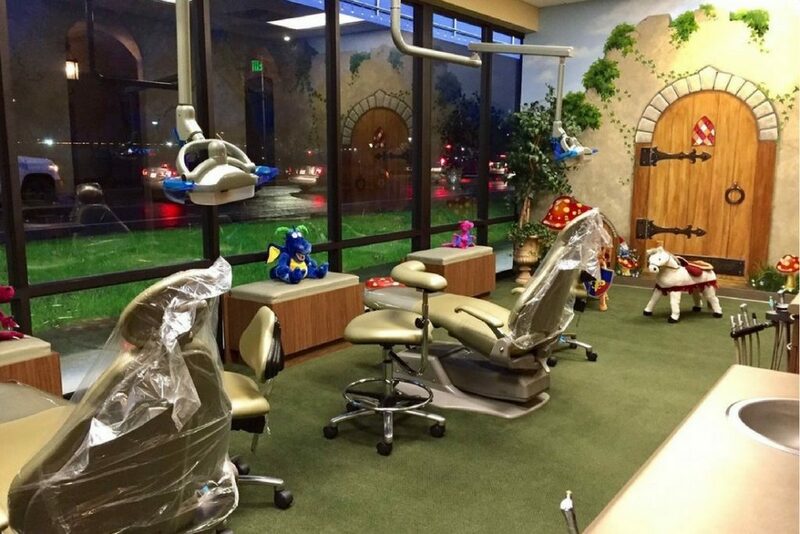 In fact, their guiding philosophy is to strive to give their patients a day at the spa instead of a day at the dentist. The dental spa provides premium care for its patients, who range from reality TV stars to professional sports players. The spa-like interior is achieved through a clean, white color palette, LED track lighting, and a screen that projects soothing images like the jellyfish pictured above. Besides beautiful sites, there is also a modern cascading water feature that offers a relaxing sound. 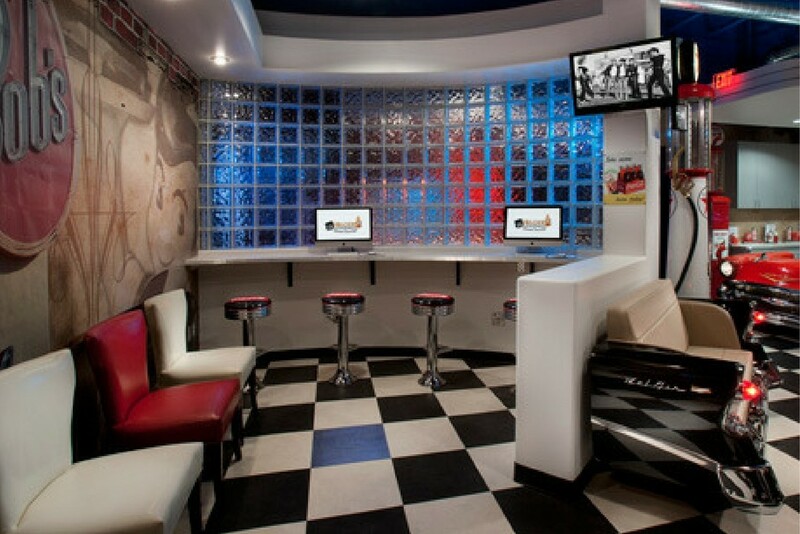 Guests can enjoy a complimentary internet cafe and coffee/beverage bar. The spa approach is resonating with patients, and they have expanded and opened a second location in the area. Their website offers Google 360 tours of both. How you can channel the cool: Be intentional with the language you use when naming your business, and fulfill that promise. The word “spa” carries a connotation of luxury and relaxation, and by delivering on that nomenclature, this practice is able to attract a specific type of customer. What type of customer do you want to attract? 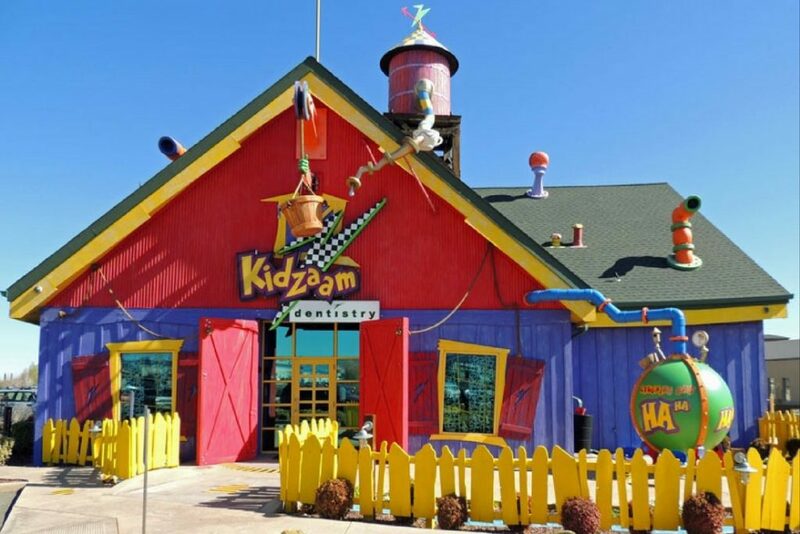 How you can channel the cool: Because Kidzaam is so dedicated to the world it has created, it has become its own “brand.” There’s even a gift shop in each location where patients can pick up things like plush versions of the Kidzaam characters. Embracing creativity can lead to equally creative revenue streams! What makes it so cool? Ever heard of color therapy? Dr. Alfonso Patron has. 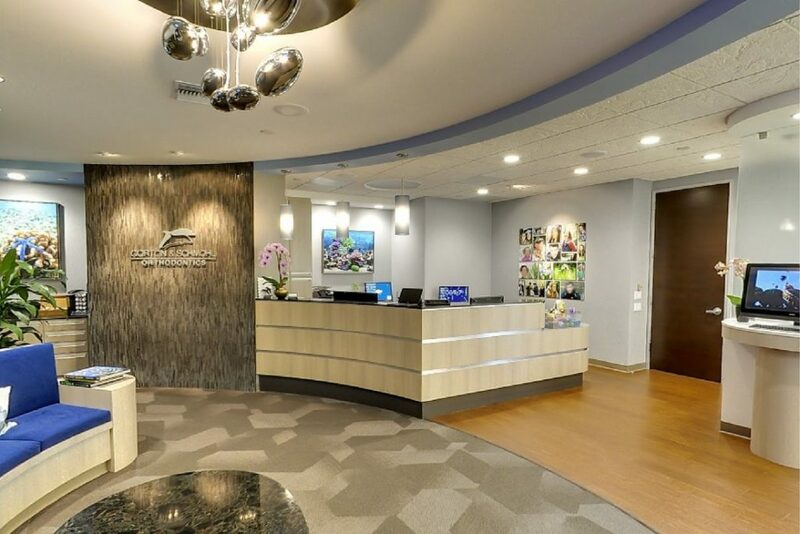 His philosophy when treating patients is to “provide quality care in a compassionate, gentle, and state-of-the-art setting.” This state-of-the-art setting and emphasis on patient education means that every operatory is a different color, and the glass door entrances list the health and wellness benefits of each corresponding hue. For example, some of the listed benefits of “orange” include: Increases confidence and joy, decreases loneliness and fatigue, increases oxygen to the body, relieves cramping, stimulates the respiratory system. 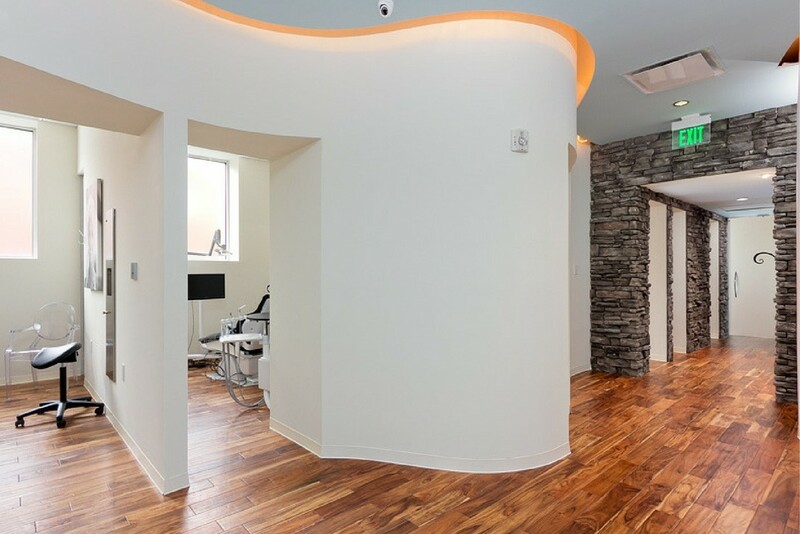 Dr. Patron and his team thank Antonio Sofán Architecture and interiors for helping them realize their practice vision. How you can channel the cool: Things don’t have to be white in order to emit a clean and sterile environment. 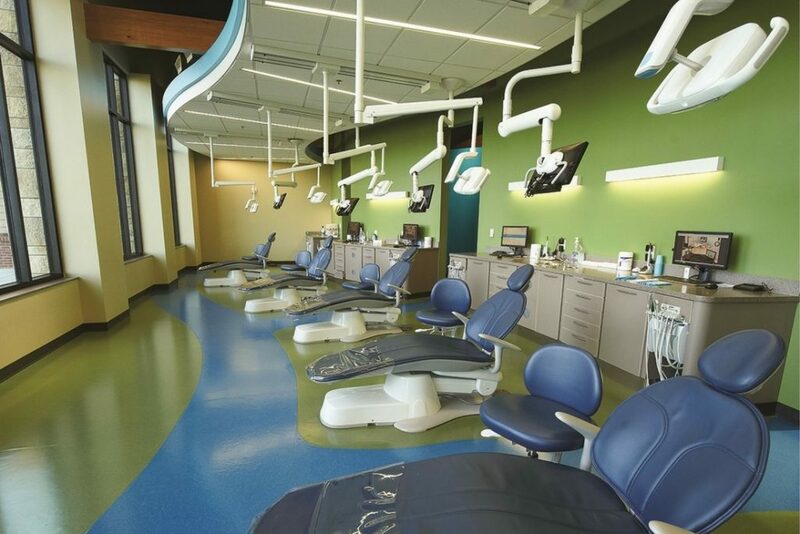 Don’t be afraid to ask your dental equipment supply partner if they have treatment centers, stools, and cabinetry in bright hues…you might be surprised what is available! What makes it so cool? Doctor David Hirsch has always been a huge Star Trek fan. 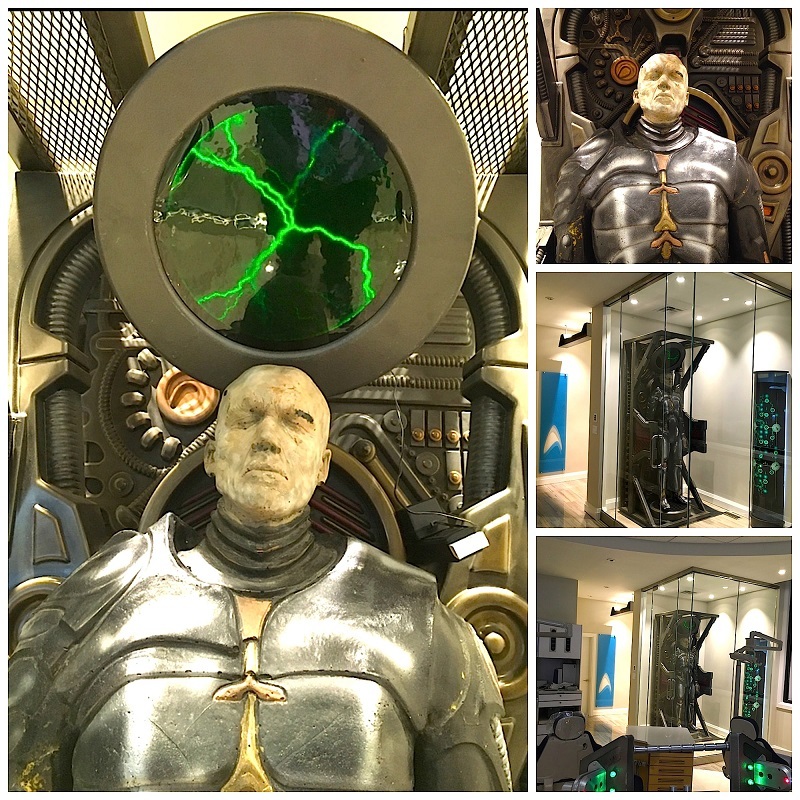 He is fond of its message that “people of different creeds cultures and backgrounds are all equal.” In 2007, when Paramount emptied its vault and put official props and memorabilia up for sale, Dr. Hirsch found a way to unite his passion for Star Trek with his dedication to dentistry, and collected as much merchandise as he could. 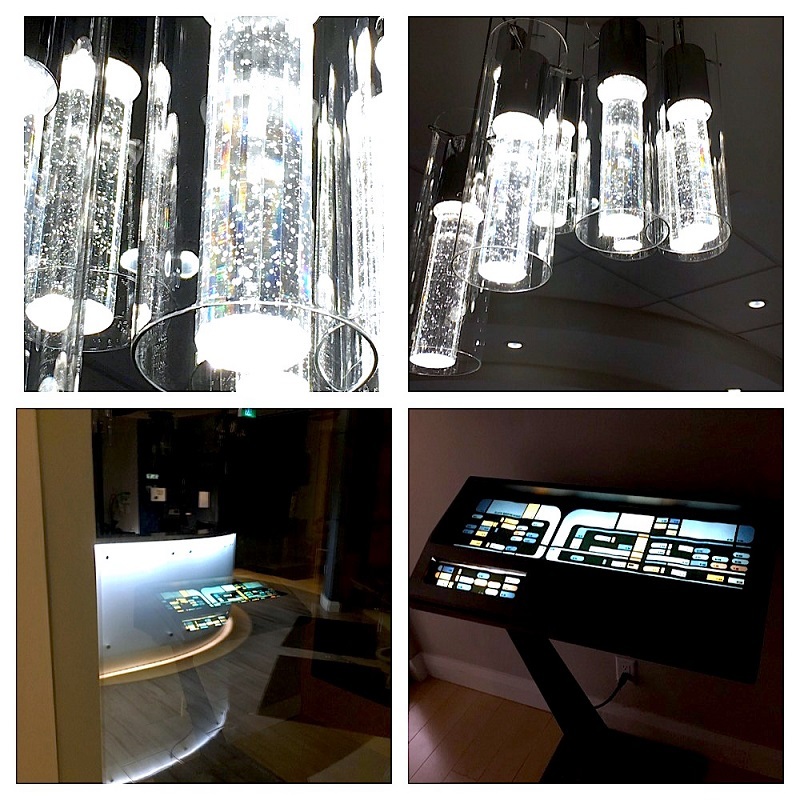 The official collectibles are complimented by futuristic lighting elements, as well as sleek touches like clean black leather and glass doors etched with frosted logos. 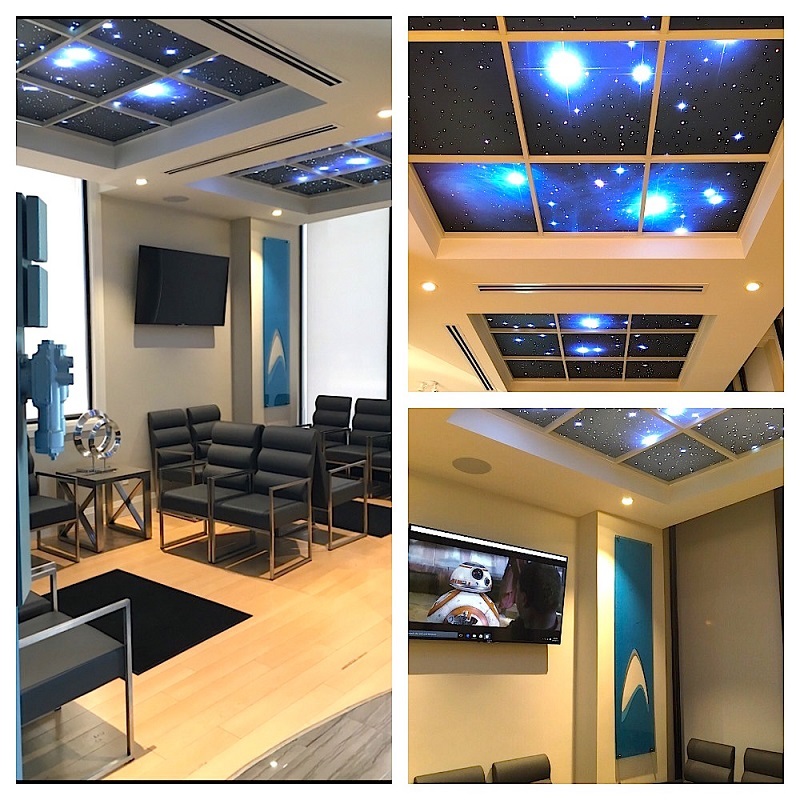 Since this practice is located in Canada, it’s technically not one of the coolest offices “in this country,” but we had to make an exception since the Aurora Borealis team is a Patterson customer, plus…c’mon it’s Star Trek! How you can channel the cool: If an opportunity presents itself for you to unite more than one of your passions, seize it! The average person spends 90,000 hours at work over their lifetime, so why not infuse those hours with as much joy as possible? What makes it so cool? 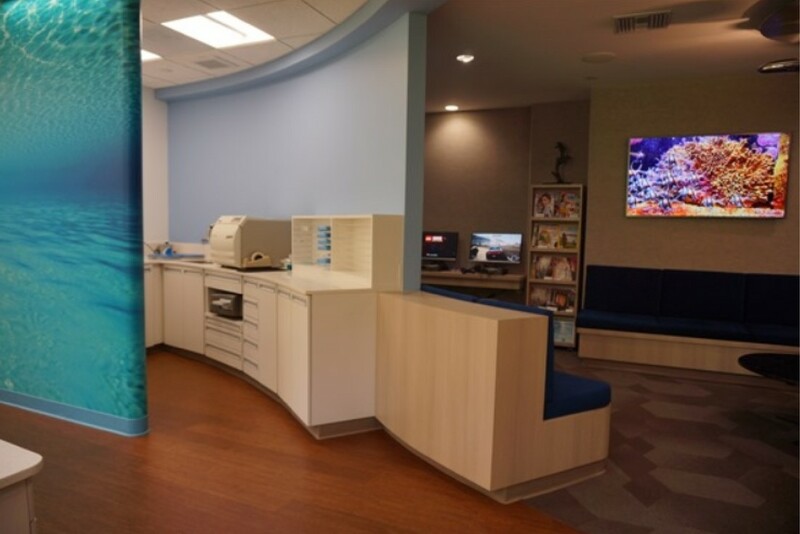 Dr. Mark Olson labels his practice as a “fusion of technology and artistry” and backs that claim up with this high style, high-tech space. 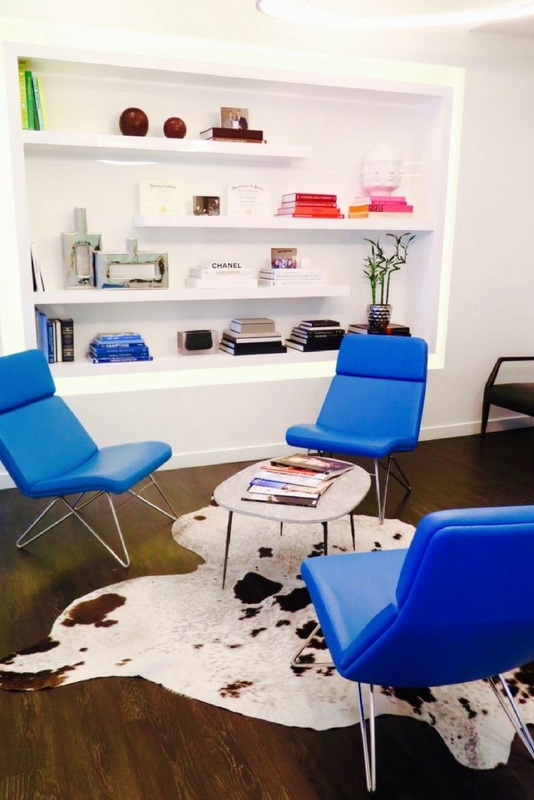 The fashion-forward waiting area features a cowhide accent rug, leather chairs in an electric blue hue, and fashion magazines and coffee table books that are a far cry from outdated issues of Good Housekeeping. 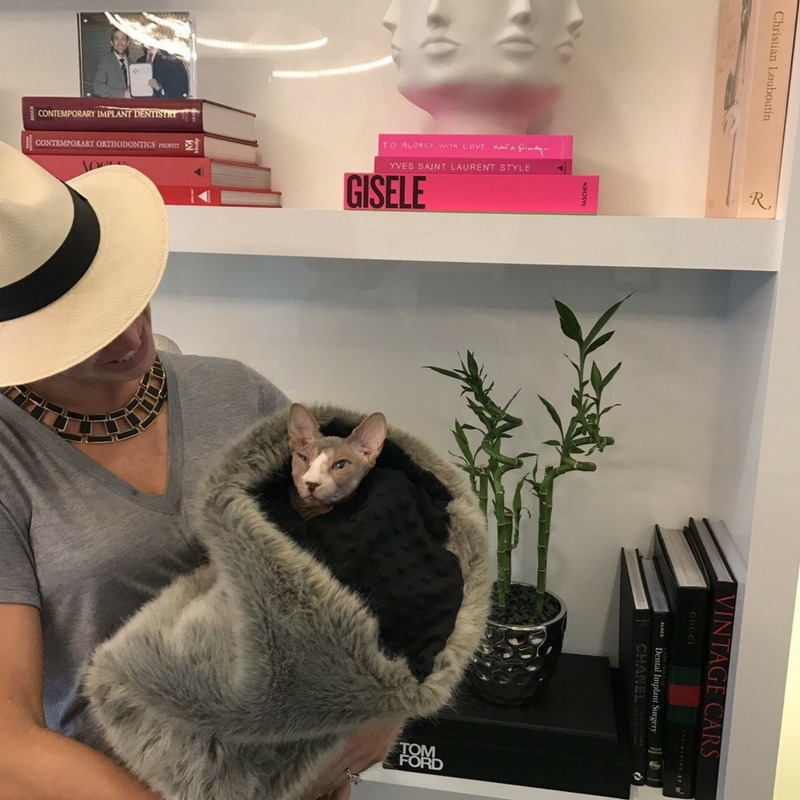 The on-trend vibe attracts clientele to match, like lifestyle blogger Alyssa Lynn Denny who states in a post from earlier this year, “when I first walked in, I had to walk back out to make sure I walked in to the right spot! 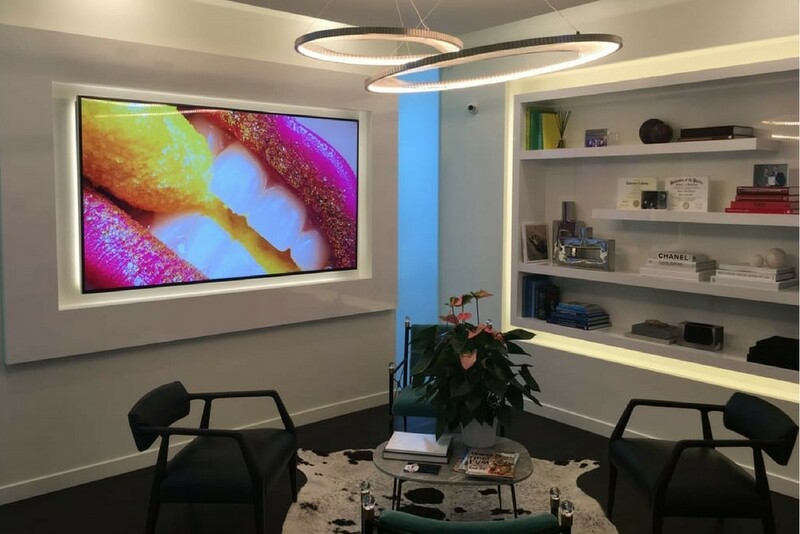 I have never seen a dentist office like this … It was fabulous!” Besides attracting the attention of local tastemakers, this practice is also on the radar of juggernauts like the LA Times, where they were recently profiled for pioneering virtual reality technology in dentistry. How you can channel the cool: If technology is something your practice prides itself on, don’t make patients wait until they are in the operatory to find that out. 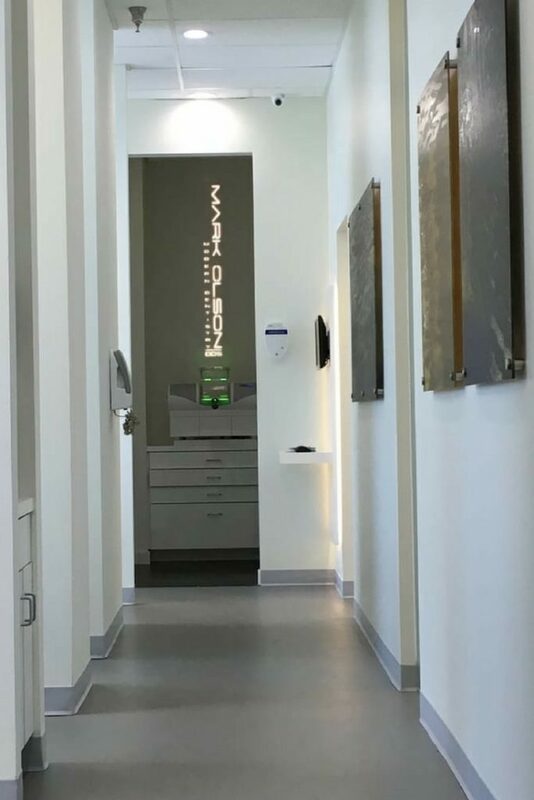 Dr. Olson’s CEREC, for example, is clearly visible from the practice’s main hallway. What makes it so cool? 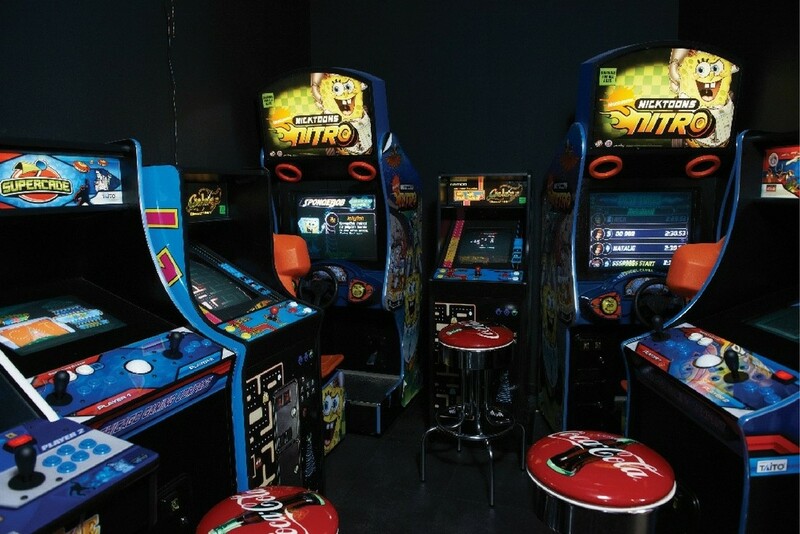 The folks at Smile Kingdom clearly share the philosophy we suggested in office #4, about delivering on the promise that your business’s name suggests. When they say kingdom, they mean kingdom! 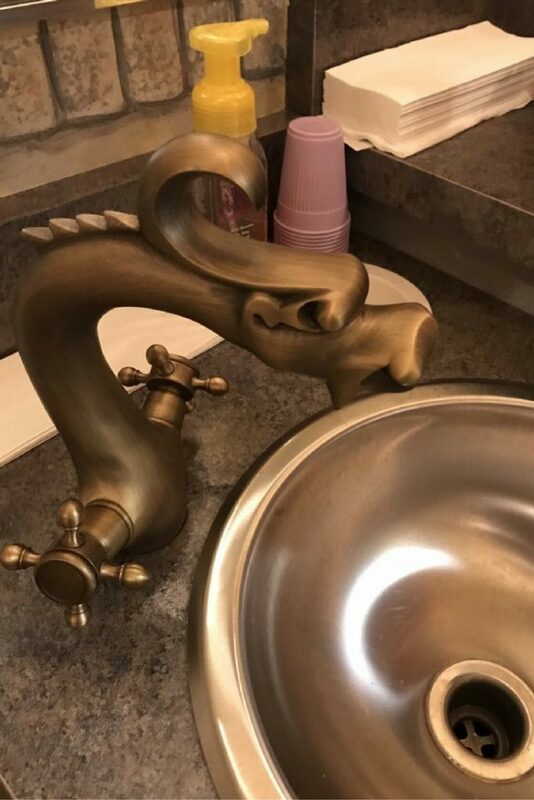 From large elements like a fantastical dragon flying straight out of the ceiling, to small elements like fairytale creature plumbing fixtures, this practice has woven storybook fantasy into all the spaces within its walls. 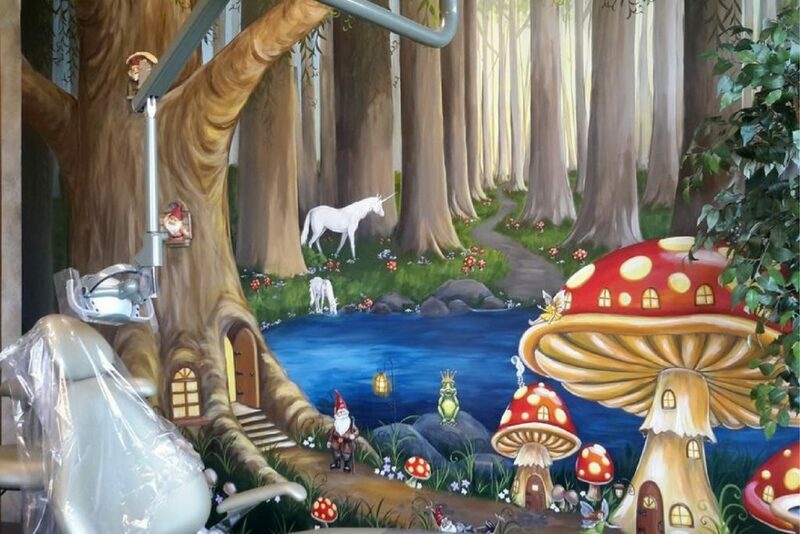 The pediatric clientele can enjoy cleanings in a friendly, open concept space, or pick out a tiara and head to one of the themed private operatories. The staff is equally as passionate about their unique practice, and office manager Danielle Mendoza was one of our 2017 AADOM scholarship winners! How you can channel the cool: Experiencing an immersive theme in-person is great for existing patients, but to get similar “buy-in” and enthusiasm from prospective patients, make sure your website also reflects your style. For example, Smile Kingdom’s site produces animated sparkles when you hover over main navigation tabs. What makes it so cool? 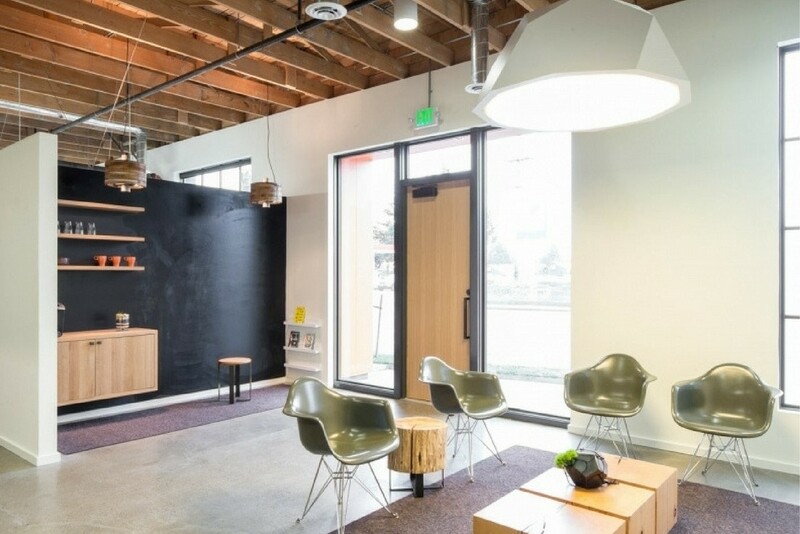 It’s clear why this Oregon practice has been featured in several interior design and viral list articles. 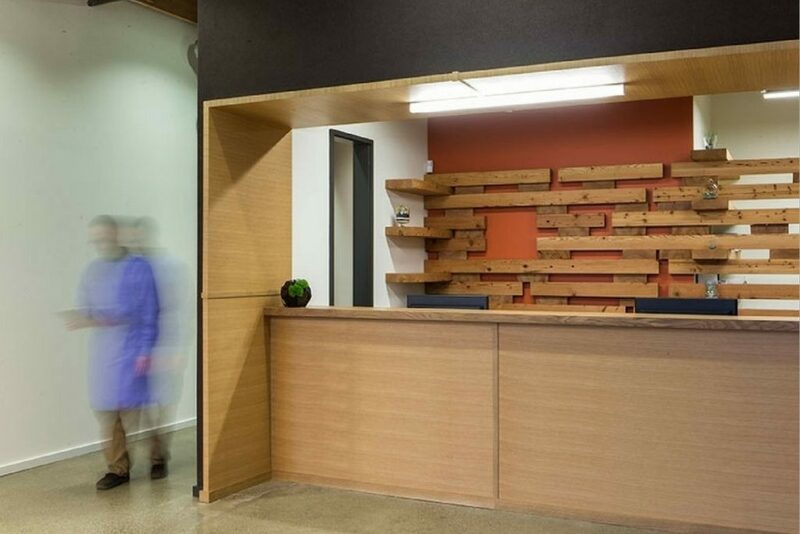 The team was deliberate in creating a space that “reflected the industrial character of the neighborhood, and the nature of the building.” The building was formerly used as a wood shop, and wherever possible, materials and finishes were re-purposed, recycled, and locally sourced. 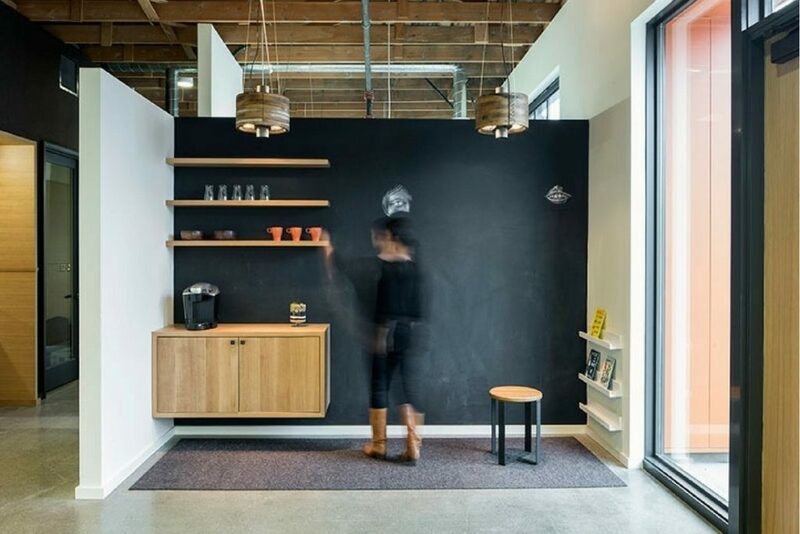 They boast a chalkboard statement wall, local white oak accent walls, and a coffee bar that serves local organic coffee. 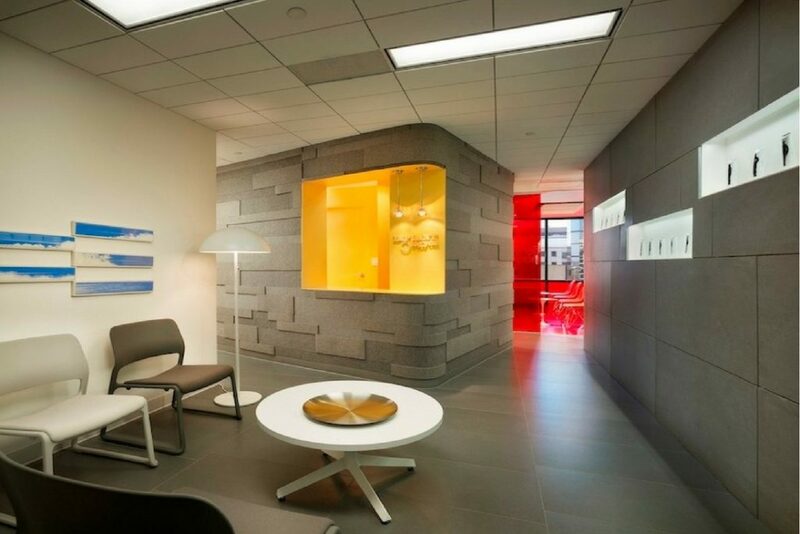 The entire design concept is based on the anatomy of a tooth, with two zones – the inner “nerve” (labs/admin/consultation spaces) and the outer “enamel” (staff lounge, waiting area, operatories). How you can channel the cool: “Locally sourced” is more than just a passing buzzword. Recycling existing materials can be a more economical option than creating something new, and partnering with local businesses for things like your coffee and snack offerings demonstrates that you are dedicated to helping your community thrive, which will inspire them to reciprocate and patronize your practice. What makes it so cool? 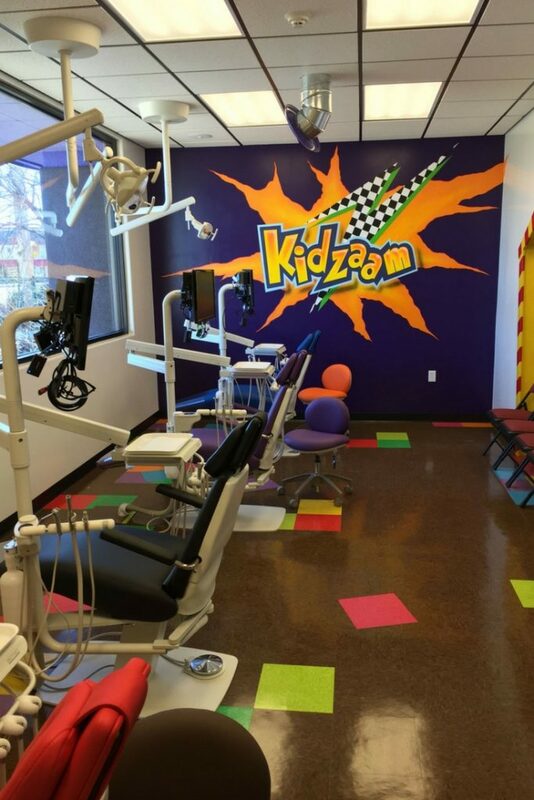 Dentistry for Kids truly placed kids at the heart of every design decision they made, from their web design, to their décor, to their approach to care. 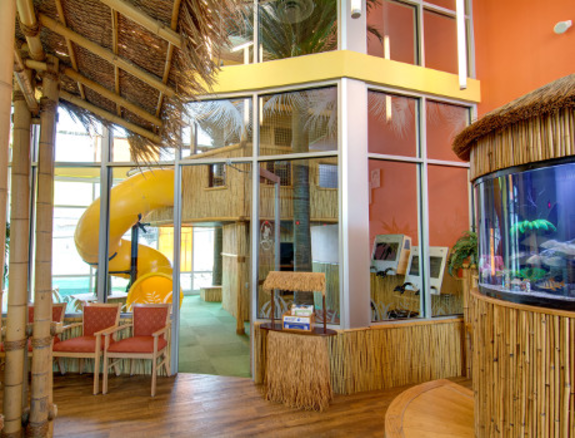 They offer open bays as well as private treatment areas, both outfitted with child-sized equipment and chairs. 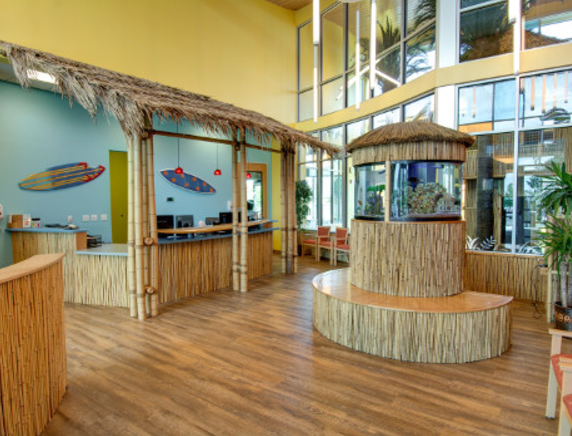 The office is decked out with surf boards, a tiki hut welcome desk, a tropical fish tank, neon lights, ceilings painted to look like clear blue skies, and even a water feature wall which provides both privacy and visual interest to patients. 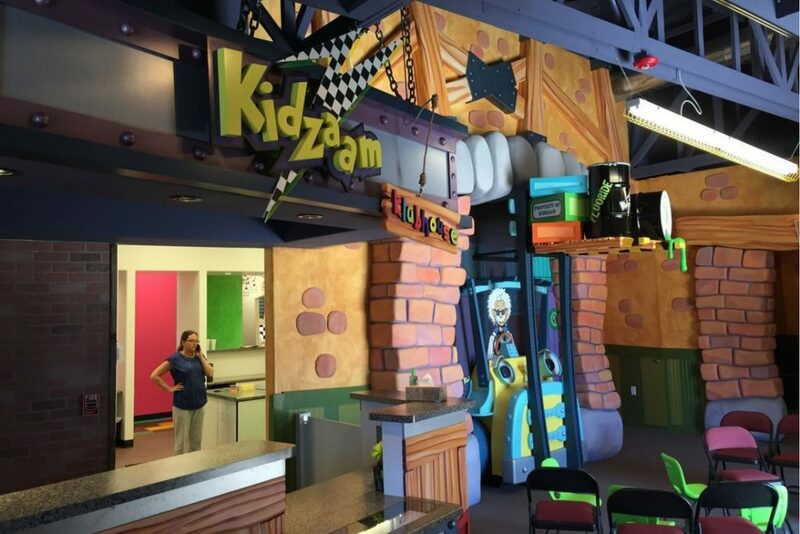 This is one of the few instances when a “longer waiting time” may be desirable, since the waiting area plays host to a giant jungle gym with a twisting tube slide. 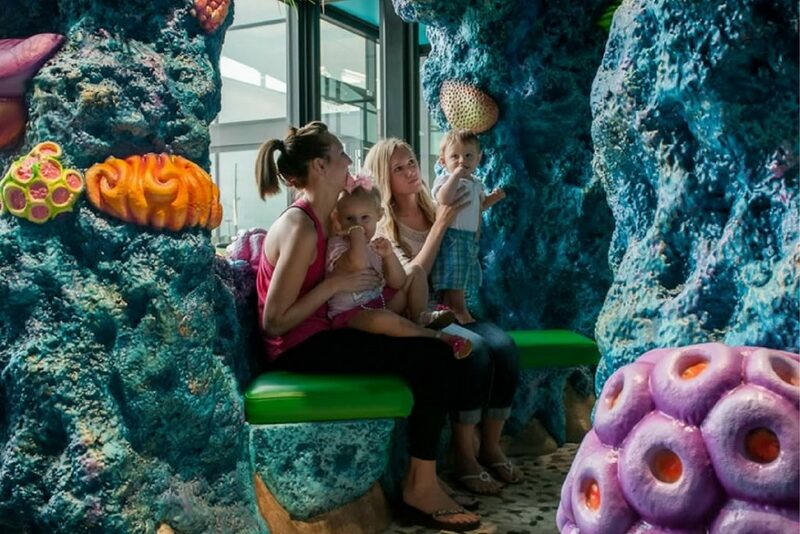 How you can channel the cool: Studies have shown that gazing at aquarium fish reduces stress. 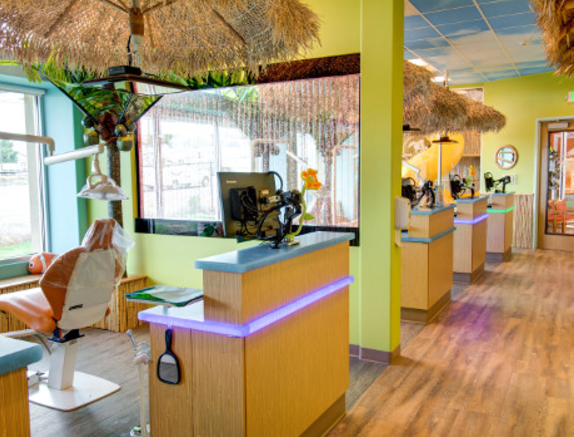 Dental-specific studies reveal that aquariums provide an equal or better benefit than hypnosis for patients with dental anxiety. 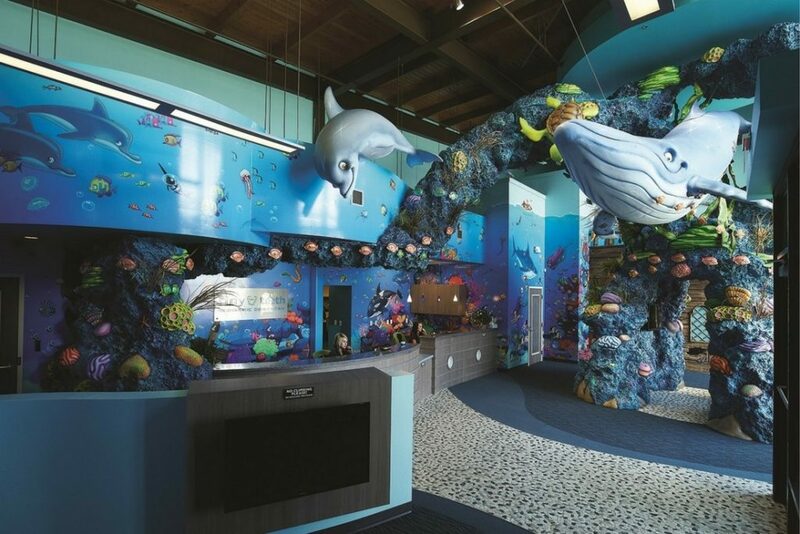 Install an aquarium in your practice, and you’ll start calming your visitors the moment they walk in the door. What makes it so cool? 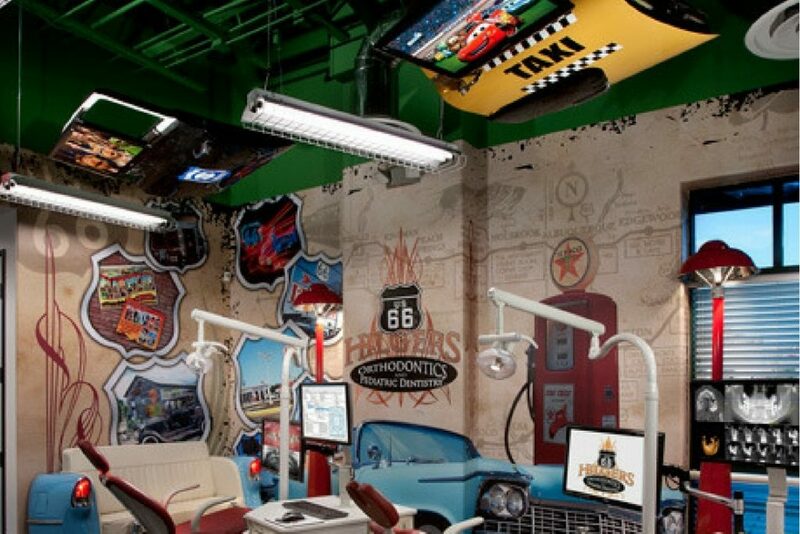 Hilgers Orthodontics wasn’t always a dental office…it began as a gas station! 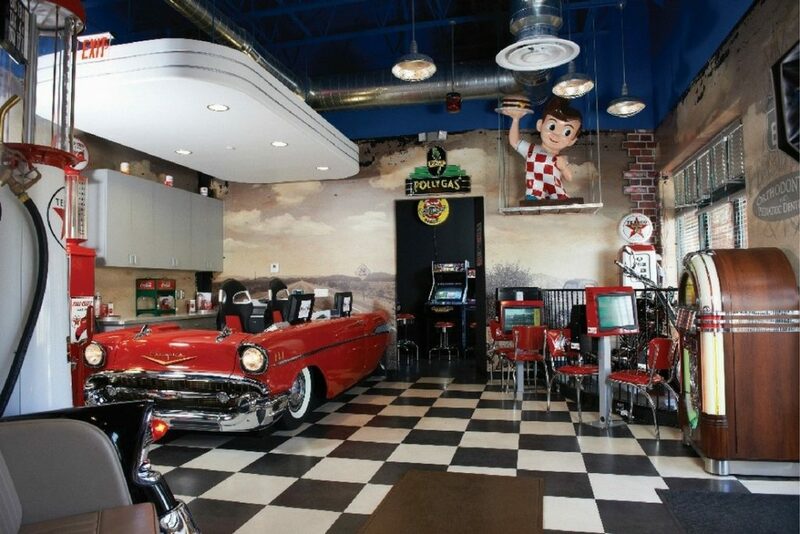 Dr. Michael Hilgers and his wife Dr. Kelly Hilgers took an inoperative gas station in Arizona and completely transformed it into a fun and nostalgic Route 66-themed practice. From used gas pumps, to car parts, neon signs, a checkerboard floor, and a ’57 Chevy for a front desk, not a detail was missed. 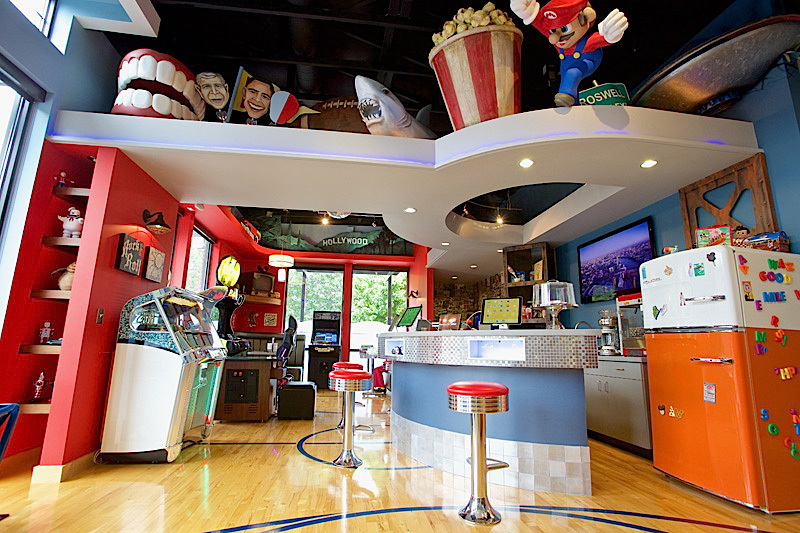 Patients can enjoy free wifi in the internet diner, play games in the retro arcade, or even catch a flick during their cleanings on ceiling-mounted flat panel monitors in car doors above all operatories. The practice was a near-instant success, and they soon opened a second, Mardis Gras themed location. 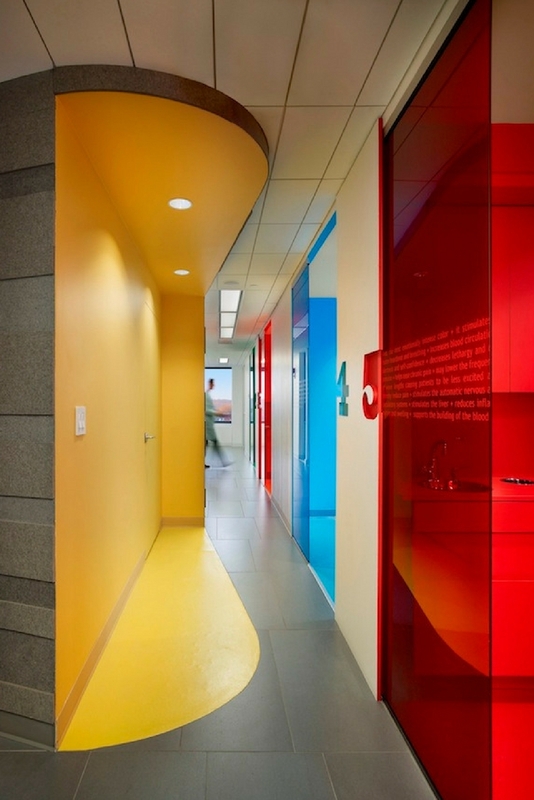 You can read more about both offices in this 2014 Patterson Today feature. 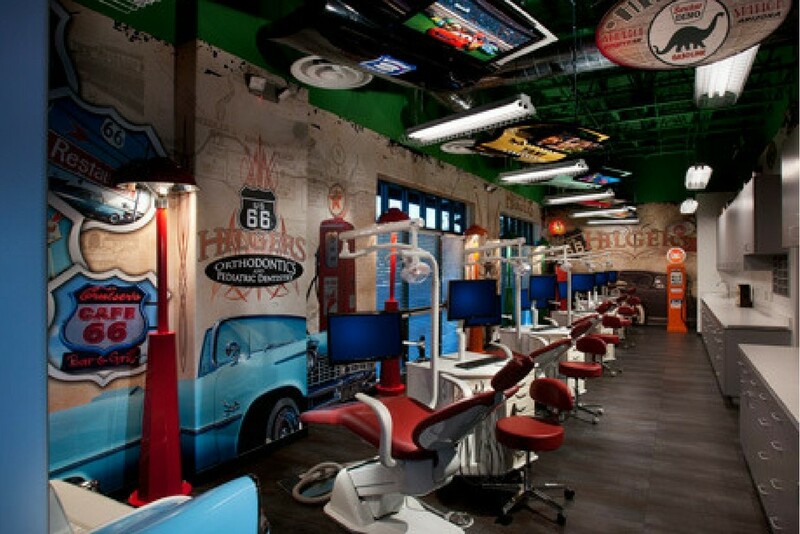 How you can channel the cool: “If you build it, they will come.” As a rule of thumb, location is one of the most important elements of a successful dental practice, but Dr. Hilgers discovered that many of his patients drive up to 25 miles for a visit! If you create something remarkable, people will put in extra effort to experience what you’ve built. 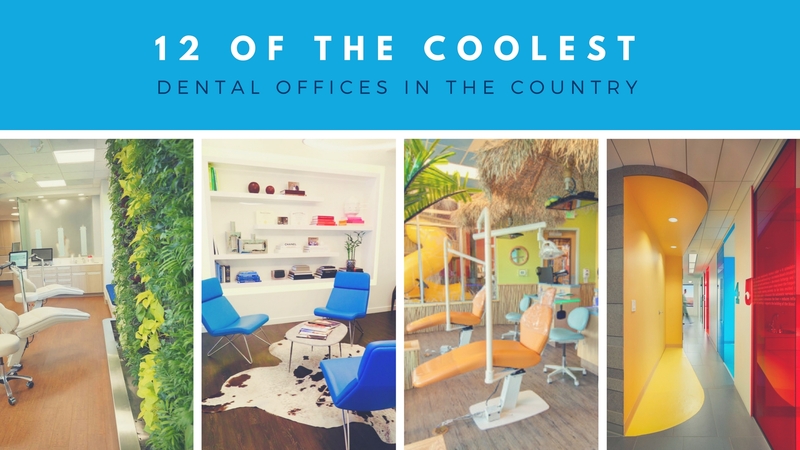 Do you have a practice that you feel is worthy of being dubbed one of “the coolest in the country?” Please share with us in the comments below! 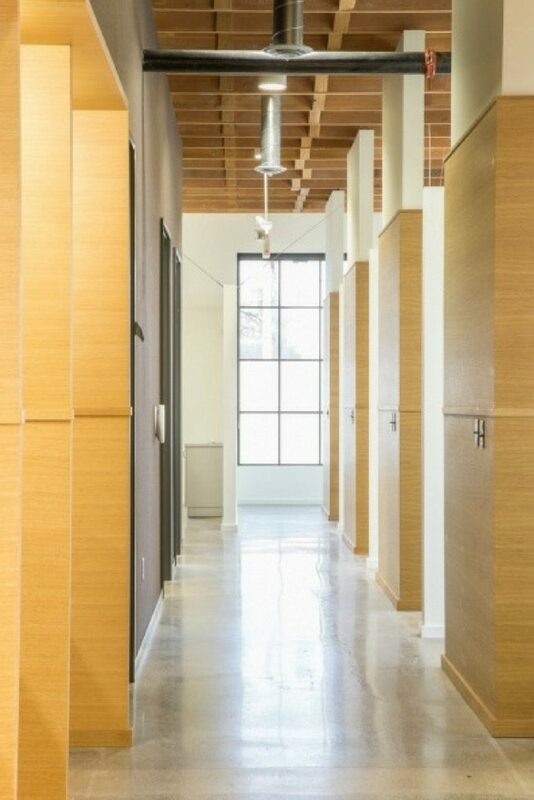 If not, Patterson’s team of office design experts would love nothing more than to help you bring your design dreams to life. Contact us any time to request more information! 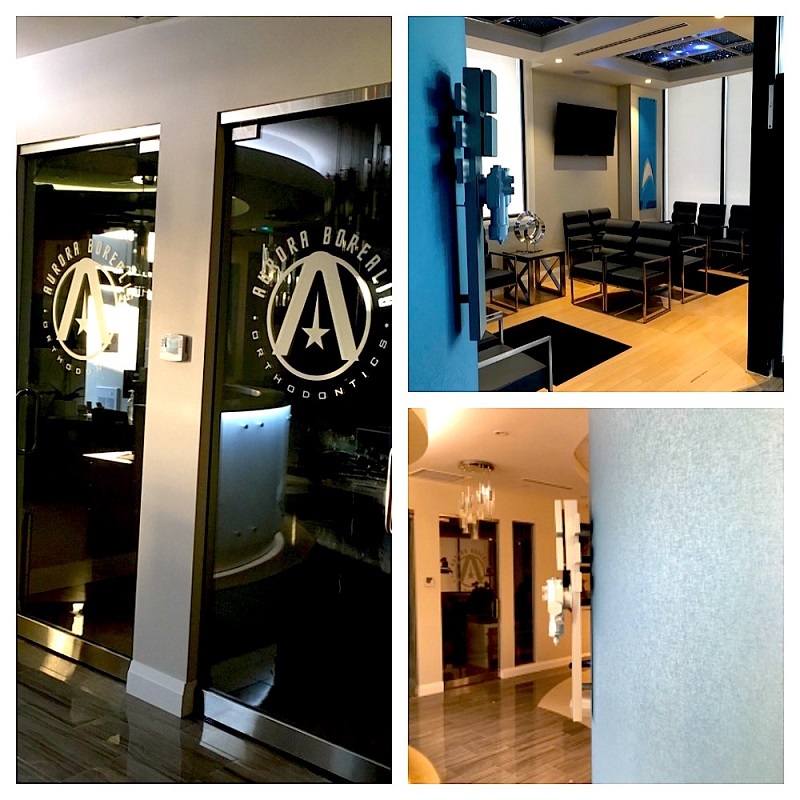 I am Arlene Williamson, the Clinic Director at Aeir Dental in Calgary, Alberta, Canada. Check out our website and judge for yourself. We were featured on front cover and inside of Patterson Dental’s Winter 2017’s edition of PattersonToday magazine. It’s stunning, Arlene! So serene and modern. It’s wonderful that you have the Google 360 tour available for website visitors too👍 Thank you for sharing! Thanks a lot for sharing such an amazing information about dental centers. 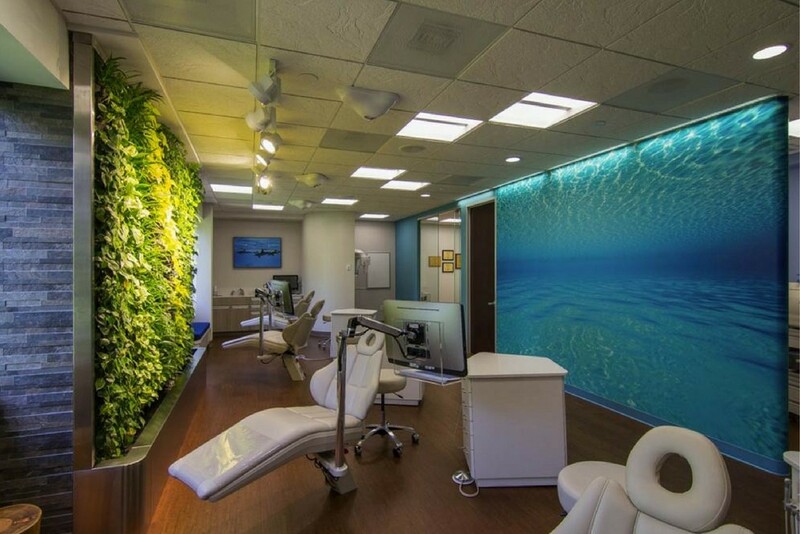 I just feel happy that these dental centers with amazing design greatly help the patients to feel good. 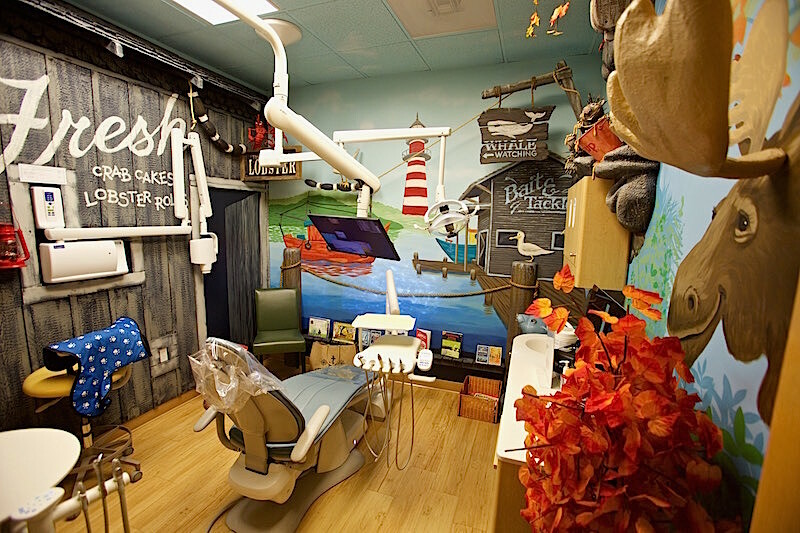 These are the amazing dental care clinics. 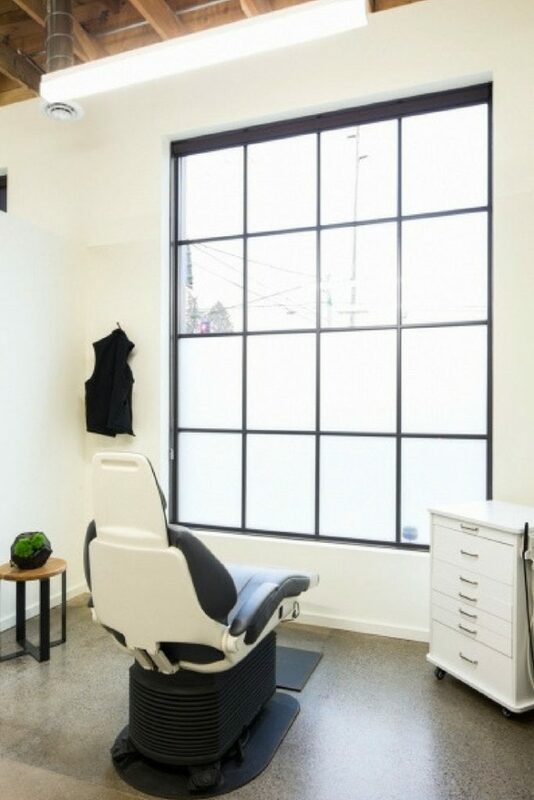 here, you can not feel like you are in the Dental office. 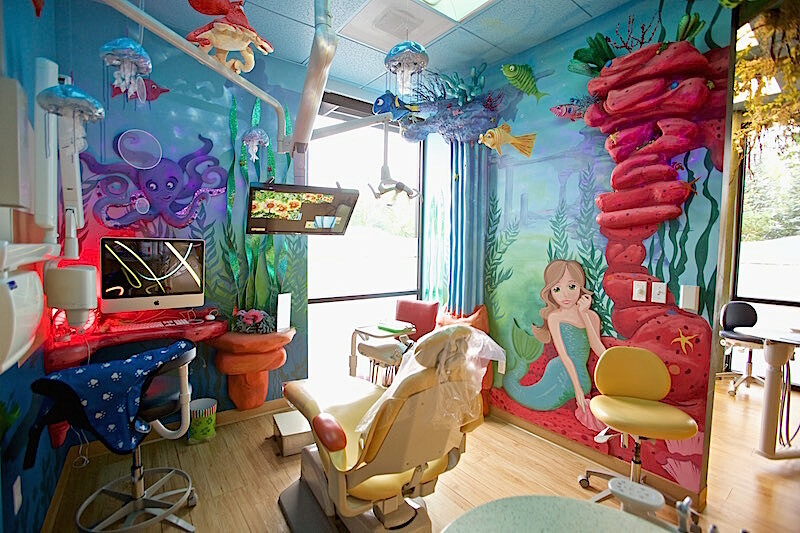 Craft Smiles Pediatric Dentistry’s provide the best Kids Dental Care at the affordable price. 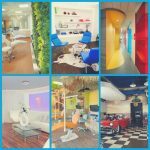 These offices are very inspiring! My current employer is in the process of looking for a location to build his already successful Oral Surgery Practice! I wish someone could help him update/upgrade his new location that he is still in search for! I feel he needs some direction!! Also his two sons that are soon to complete dental school will be taking over, following his footsteps to be a great dental profession as he’s been for 20+ years! We’re located in Danville, VA. This is absolutely FANTASTIC, Dr. Fulford! Thank you so much for sharing your practice website with us, and for the kind words about Patterson. We love that you call new patients “campers!” If we put together a roundup pt II, we’ll most definitely let you know. 👍 Thanks again! 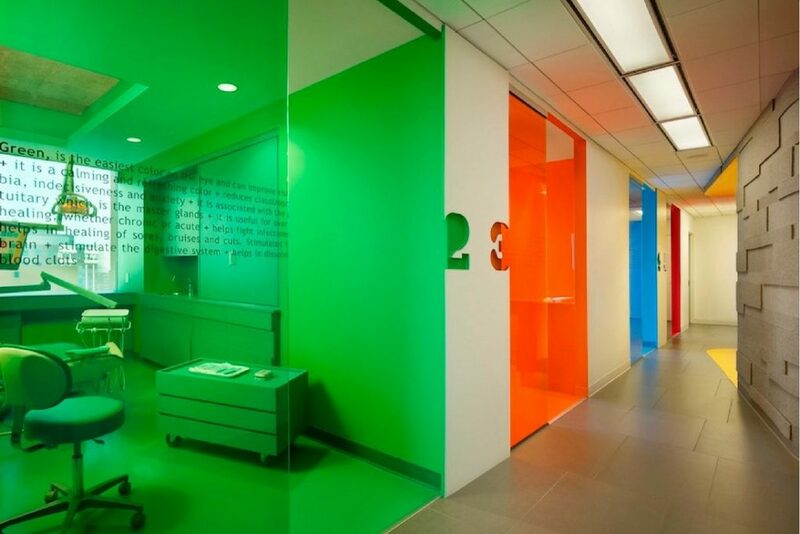 Those were some colourful dental clinics to elevate patients mood. 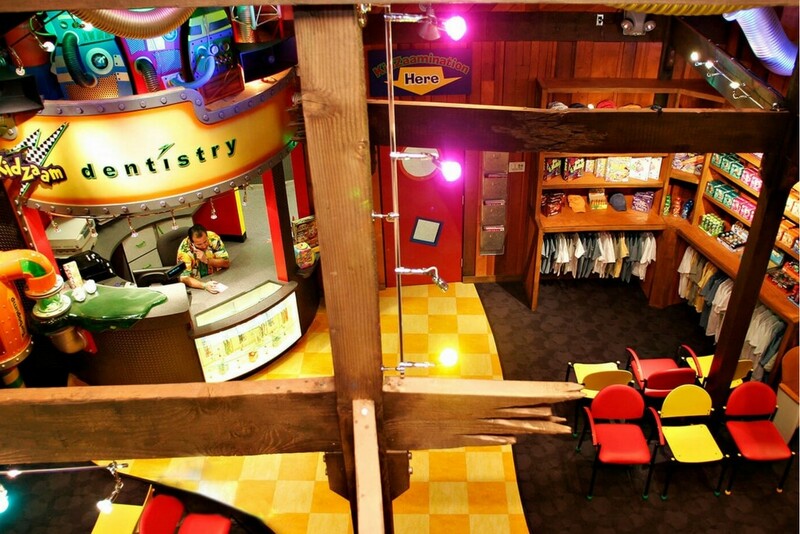 Those were some amazing pediatric dental clinics.